Celebrate with something different and insanely delicious: a cookie covered in layers of chocolate. A typical birthday includes Mom's embarrassing baby stories, brightly wrapped gifts, and the standard: cake. But who made cake the queen, anyway? Celebrate with something different and insanely delicious: a cookie covered in dense layers of smooth dark and white chocolates. 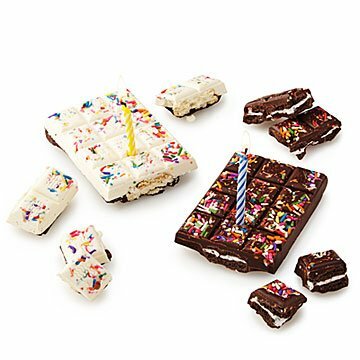 The decadent bars are fiesta-ready with a generous covering of sprinkles and an included candle that fits snuggly into the middle. We don't doubt you could finish it yourself, but the rich treat is excellent for sharing with your closest cohorts. Handcrafted in California by Kimberly Udko, celebrator extraordinaire. Kimberly’s quest to create the ultimate decadent treat began at an early age in the kitchen of her mother, who owned a successful candy company. Years later, Kimberly studied abroad in Belgium, where the world’s finest haute chocolatiers inspired her to create her own innovative line of artisan chocolates. She set out to combine the luxury of Belgium’s first-class tradition with the playful exuberance of her favorite childhood confections. Candle included. Color may vary. Great idea for birthday wishes (especially for someone not local). It was a perfect birthday present. They enjoyed sharing their birthday cookies with their friends and family.